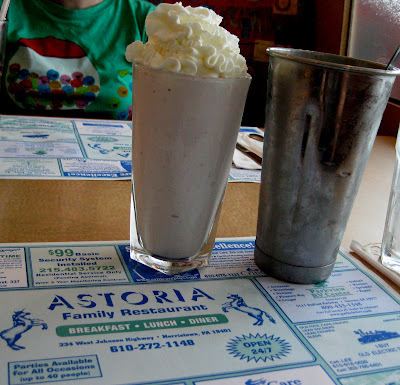 The Astoria Family Restaurant. When we got there on a Sunday afternoon (early), the place looked closed. There were barely any cars. I really thought the place wasn’t open. But alas, it was open. There were maybe 2 other parties there. All R wanted was an omelette with a tiny bit of cheese and some hash browns. First, she got this mixed up hash, which had scrambled eggs, potatoes, onions and peppers, ham, and tons of cheese all mixed in. She couldn’t eat it, and asked for an omelette with peppers and onions and ham and a bit of cheese with a side of hash browns. Round 2, she got the hash browns on the side, but the omelette was still a jumbled mess, with tons of cheese on top. She barely ate this too. The waitress was super sweet though, and offerred to send it back again, but two attempts is enough, no? She just picked at it for awhile. I wasn’t that hungry, so I just had pie and a shake. 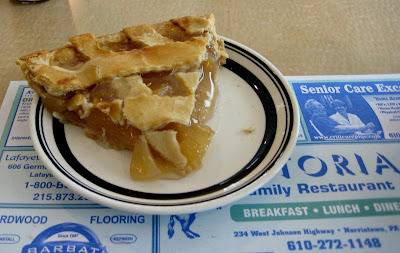 The shake was good, the pie was a bit too sweet. Ok, would I eat here again? Um… if I had a choice, not really. But I’m sure I’ve had worse. On Friday, November 7, 2008 a co-worker & I stopped in for lunch. She ordered a pizza steak, & I ordered what the waitress told me was a platter because it did not say it came on any kind of bread on the menu. It was supposed to be breast of chicken with fried onions, mushrooms, & red peppers with melted cheese on it. We both ordered a soda. Hers came out first with a pickle & bag of chips. About 5 minutes later mine came out on a hamburger bun, no chips or pickle. My friend didn’t want her chips & gave them to me, so I opened them & put them on my plate. I took a bite or two & realized the vegetables were missing. It did have a slice of tomato & some lettuce on it. After a while I finally got the waitresses attention & pointed out to her that the order was incorrect. She never said a word but instead she curtly grabbed my plate & ran off to the kitchen. When she finally returned with a new piece of chicken on a new bun, a fresh tomato slice & lettuce, there were still no peppers on it, no pickle, & the chops were gone. I ate it anyway rather than send it back again & waste my lunch break. When we went to pay the bill my friend asked the waitress to please ring up our lunches separately. This brought on a very discourteous tirade from the waitress who then proceeded to charge me $10.49 for a $6.95 lunch that was never delivered correctly, plus the $1.50 soda. I told her this was absolutely not correct which brought on a terrible attitude & a remark was made as though I didn't know that there was tax on the lunch. No matter how you add it up, there is not that much tax on $8.45. When I learned math, $6.95 + 1.50 come to $8.45, & tax on that should be 51c for a total of $8.96. This restaurant has lost my business & if they do this to all their customers I can see why their parking lot & restaurant are always empty.